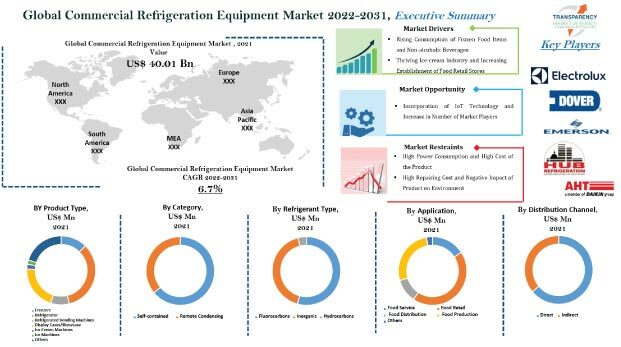 The global commercial refrigeration equipment market has a highly competitive vendor landscape, exhibiting the presence of numerous players, states Transparency Market Research (TMR). Companies in this market are involving into mergers and acquisitions that have given them a strategic advantage to strengthen their position in the market. Some of the key players in the commercial refrigeration equipment market are Whirlpool Corporation, Ltd., Haier, Inc. (Haier Group), Beverage-Air Corporation (Ali S.p.A), United Technologies Corporation – Unit (Carrier), Ingersoll Rand Plc, Dover Corporation, Hussmann Corporation, Metalfrio Solutions SA, Daikin Industries, and Illinois Tool Works Inc. Many companies are putting efforts in expanding their product portfolio, adopting newer strategies for product differentiation, and increasing supply of equipment for the end-use industries will expand the market. According to TMR, the global market for commercial refrigeration equipment, which was US$ 39.44 bn in 2016, is expected to reach US$ 66.88 bn by the end of 2022. The market is also estimated to rise at a CAGR of 9.1% during the forecast period starting from 2015 and ending in 2022. Based on product type, transportation refrigeration equipment segment is expected to lead the market in coming years. Globalization and liberalization of agriculture will give impetus to the segment over the coming years. Geographically, in the global commercial refrigeration equipment market Asia Pacific is holding the leading position as a reason for increasing food industry in the region. Growing disposable income is also contributing in increasing this market in Asia Pacific region. Globally, changing lifestyle has developed the need for ready to eat food products. Moreover, the need for products that have high shelf life and limited time dedicated to household chores have significantly boosted the demand for processed food. Therefore, these factors will increase the demand for commercial refrigeration equipment market. Moreover, increasing demand for eggs, meat, fish, and other animal derived food has certainly expanded the market for commercial refrigeration equipment. Advancements taking place in refrigeration equipment that are focusing on providing high efficiency with price regulation has gained momentum to expand the commercial refrigeration equipment market. Furthermore, developing horticulture and animal husbandry practices where in a large amount animal meat and products needs to be stored that may boost the market for commercial refrigeration equipment market. Various restrains may limit the growth of the commercial refrigeration market during the forecast period. High installation cost involved with commercial refrigerators and uneasy replacement of commercial refrigeration equipment may hinder the market to attain growth at its full potential. In addition to that, increasing environmental concerns and stringent environmental regulatory policies with the use of refrigeration equipment emitting harmful gas may also hamper the growth of the market. However, technology advancements and increasing availability of quick service restaurants are expected to give impetus to the commercial refrigeration equipment market.